NEW DELHI - An extensive sight-seeing tour of New Delhi would include a visit to the Qutub Minar, a drive along the ceremonial avenue - Rajpath, past the imposing India Gate, Parliament House, the President's Residence and would end with a drive through the Diplomatic Enclave. Morning picked up from hotel and dropped at the New Delhi Station for your journey to Agra. Arrive Agra, meet & assistance at the railway station. Later transfer to the hotel and check-in. Later proceed for city sightseeing tour of Agra visiting the world famous Taj Mahal, built by the Mughal Emperor Shahjehan in 1630 for his queen Mumtaz Mahal to enshrine her mortal remains. Also visit Agra Fort, containing the Pearl Mosque - the rusty and majestic red- sandstone fort of Agra stands on the banks of the river Yamuna and Emperor Akbar started the construction in 1566. At the Diwan-I-Khas (hall of private audience) where marble pavilions with floral inlays lend an ethereal ambience, the Emperor sat on his gem-studded peacock Throne and met foreign ambassadors and rulers of friendly kingdoms. Night stay in Agra. Morning drive to Jaipur enroute visit Fatehpur Sikri. The deserted, red Sandstone City, Emperor Akbar built that as his capital and palace in the late 16th century is an exhilarating experience. It a veritable fairytale city and its "ruins" are in pristine condition ... it's not hard to imagine what the court life must have been like in the days of its grandeur. Also visit the Bulund Darwaza, the largest gateway in the world. Continue drive to Jaipur. Arrive Jaipur & check-in at hotel. Night stay in Jaipur. Morning proceed for city sightseeing tour of Jaipur visiting. Morning check-out from the hotel and proceed for a morning excursion to Amber Fort. Elephant ride ascent to the fort. 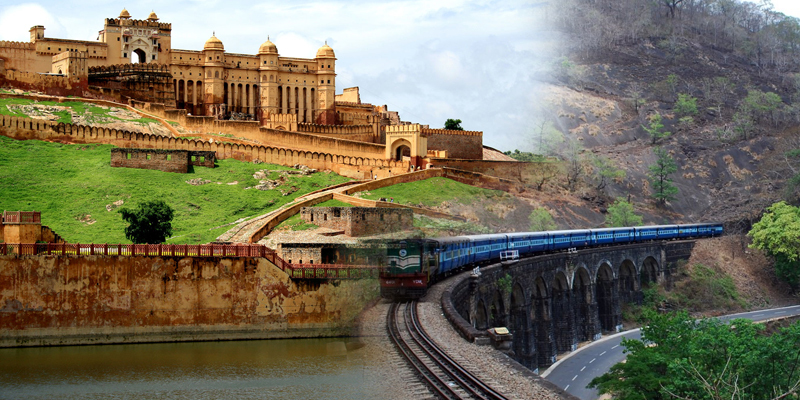 JAIGARH FORT - The Western skyline is dominated by the extensive parkotas (Walls), watch-towers and gateways of Jaigarh. It is one of the few military structures of medieval India preserved almost intact containing palaces, gardens, open and covered reservoirs, a grannary, an armoury, a well-planned cannon foundry, several temples, a tall tower and a giant mounted cannon the Jai Ban the largest in the Country.